Gasoline and diesel fuel itself is hydrocarbons. Incomplete combustion leads to produce a small amount of tar. It makes carbon deposit in the engine room. It affects the efficiency of engine combustion, thereby reducing the vehicle power, increase vehicle fuel consumption, cause serious pollution for the city environment. 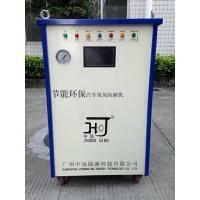 Our Carbon Removing Machine through the electrolysis of water to produce hydrogen and oxygen and use hydrogen and oxygen molecules to remove the carbon deposition in the engine room. Ox hydrogen has the features of inner wall attachment, catalytic, high temperature. It discharges carbide of HC, CO, CO2 through combustion splitting carbon. However, Hydrogen and oxygen gas mixture (also known as Brown) to generate only water after combustion. Finally it discharges from the engine by stains as flow liquid. Through the removal of carbon, maintains the auto engine, eliminates the auto defects caused by carbon deposition such as engine start adverse, unstable idle speed, poor speed up, large oil consumption, shake out, knock, exhaust emissions and etc. 1. Complete model: Auto carbon removing machine has an hour gas production 1000L, 2000L, 3000L, 6000L, whether it is a car or truck, gasoline or diesel, can realize safe and clean carbon removal effect! 2. Convenient: Only 15 - 40 minutes, easily remove the car carbon! 3. Save energy: carbon removing machine gas production per kiloliter only need 2.5 degree, allowing you to save money! 4. Automatic control: If the engine starts, carbon removing machine provides gas automaticlly. If the engine stops, carbon removing machine stops the gas supply.